Trulio with their Mobile ID innovation impressed judges across every judging criteria, from originality to implementation, making them the clear Category Winner for Compliance Innovation. RemTECH judge and Executive Director at JP Morgan Chase for real-time payments US launch, Sofia Freyder cited, “global compliance and regulatory challenges,” as the industry hurtle she is most interested in finding innovative solutions towards. The Compliance Innovation was certainly a category to keep an eye on. 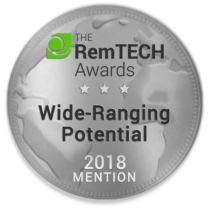 The judging panel used the RemTECH Awards 2018 voting decentralized application developed by Yokip Consulting with Horizon State technology, which stores each of the judge’s ballots on the Ethereum blockchain by category via a category-specific smart contract. The results for Trulioo’s Mobile ID are publicly visible for audit on the Ethereum explorer at the following Compliance Innnovation smart contract address. This data is unalterable. The judges and entries were assigned reference numbers to maintain their anonymity. We’ve decided to only reveal the reference numbers’ of the winners. Trulioo’s Mobile ID is cba31922-0a3f-4c69-a6ab-15e10b61ac34. The scoring from the judges are presented below for readability with additional averages calculated for analysis and to determine winners. The RemTECH Awards is designed to showcase the latest in remittance innovation to the industry. Trulioo’s Mobile ID will be presented their award at the ceremony, which is hosted at the Global Forum on Remittance, Investment and Development (GFRID 2018) organized by the Bank Negara Malaysia, the International Fund for Agricultural Development (IFAD), and the World Bank in Kuala Lumpur, Malaysia. The Trulioo’s Mobile ID will also make it on to the ballot of the Industry Choice Award. All registered GFRID 2018 participants will have the opportunity to cast their ballot in this last part of the RemTECH competition. For the past ten years, the GFRID gathers Member States, international organizations, private sector, and civil society from different regions of the world with the aim of raising awareness, and promoting dialogue and collaboration between stakeholders over the most pressing issues facing migrant remittances towards sustainable development. GFRID 2018 participants will represent stakeholders in the remittance industry, particularly in Asia-Pacific, and will make for qualified voters in this final award. The industry vote will also be using the Yokip Consulting and Horizon State blockchain voting application. In this version, the votes will not only be stored on blockchain but also will be tallied using the application without any additional human interference.